Infographics Lab 3.4.6 – Visualization graphics for Keynote. Infographics Lab (was Infographics, then was Infographics Lab for Keynote, then was Infographics Lab) contains a wide range of high-quality designs for illustrating your Keynote presentations. 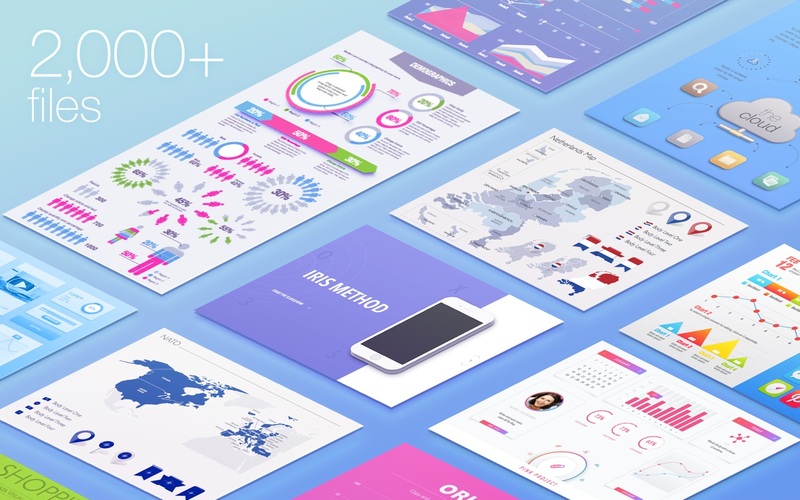 Whether your slideshow is focused on a specific country, explains intricacies of an industry, or presents annual financial results Infographics is a go-to selection of quality visualization tools. All images include transparent backgrounds that allow placing them on various colors and patterned backgrounds. Most elements are drawn in shapes, and you can easily change their fill, opacity, and other parameters. It is designed to be used with Apple’s Keynote but you can also paste the images to Pages, Numbers, or iBooks Author. Next story A Better Finder Rename 10.38 – File, photo, and MP3 batch renamer. Previous story EazyDraw 9.1.2 – Vector-based drawing application. Branding Lab – Templates 3.3.2 – Templates for Pages. Templates for MS Word 5.0.1 – Add style and class to your MS Word docs. Flyer Mill 1.7 – Templates for Pages.